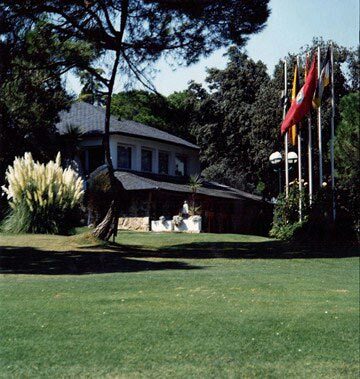 The Country Club was officially opened in 1931, occupying land owned by the Madrid City Council. The grand opening was an important social event. A year later, a 9-hole golf course was opened, and with this course the Club's great love of golf began. In 1942 the Country Club merged with the Spanish Royal Equestrian Society to form the Royal Spanish Equestrian Society Country Club, and the construction of the social complex began at the same time as the plan was drawn up to promote horse riding, tennis, golf, hockey and swimming. Since then, the Club has continued to expand its facilities and membership. Since 1984, when the Madrid City Council exercised its rights over part of the land on which the Club is situated, a mixed public limited company has been created, with the Spanish Royal Equestrian Society Country Club holding 49 per cent of the shares and the City Council 51 per cent. This company was limited until 1993, although it was later decided that the Club would continue to be managed in the same way until 2025, becoming a part of the shareholding of the State Equity, which took 50 percent of the package held by the Spanish Royal Equestrian Society Country Club. From that moment on, the construction and remodelling of a number of facilities began. For example, in 1989, the artificial grass hockey field was officially opened, the best of its kind in Spain. In 1992, one of the most important events in the history of the Club took place: the Mayor of Madrid, Mr. José María Álvarez del Manzano, and the Cantabrian golfer Severiano Ballesteros, signed the contract for the construction of nine additional holes to complete a new course. The Villa de Madrid Country Club is unique in its characteristics and its exceptional location, as it is only a few minutes from the centre of Madrid. A number of sports facilities have been built in its vast area of over 200 hectares, which are difficult to find in a single site. First class competitions of Golf, Tennis, Horse riding, Polo, Hockey, Squash, Paddle, etc. can be held at the same time, as well as a wide range of social and leisure activities, not to mention the excellent Olympic-sized swimming pool with retractable roof that can be enjoyed all year round. The Villa de Madrid Country Club encourages the practice of sport by organising sports schools, which have almost 2,000 students and more than 68 teachers. These provide the basis for all the teams at the Club. The life of the Club is irrepressible, with its sports teams continuing to compete and achieve success. The facilities continue to grow, while numerous national and international sporting events at the highest level such as World and European Championships are held. Events attended by thousands of spectators. We hope that through this website we will improve the promotion of sports and offer our members an increasingly easier, faster and more efficient management, resulting in a better service and continuing to make the Villa de Madrid Country Club a unique Club.